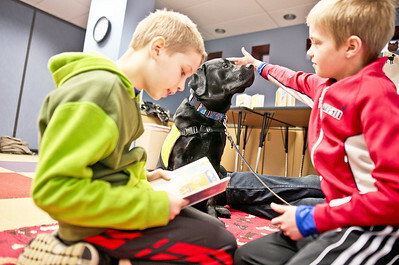 Michelle LaVigne/ For Shaw Media Eleven-year-old Cam Slonneger of Crystal Lake pets Ozzie while his nine-year-old brother Kai reads from a book they picked out from the Crystal Lake Public Library. Ozzie is a part of the Pet Partner volunteer team which paid a visit to the Crystal Lake Public Library on Tuesday, April 2, 2016. While Ozzie is new to visiting the library, his great great grandfather was a part of the program when it first began. And Ozzie apparently is already a fan. "He this this rocks," said his owner, Peggy Roesner of Woodstock. "He's Mr. Greeter." Michelle LaVigne/ For Shaw Media Seven-year-old Kiera Mulcahy of Crystal Lake reads "The Little Pea," to Joey, a part of the Pet Partner volunteer team, at the Crystal Lake Public Library on Tuesday, April 2, 2016. Michelle LaVigne/ For Shaw Media Five-year-old Eli Parks of Crystal Lake gets settled in to read to Ozzie, a member of the Pet Partner volunteer team during visit to the Crystal Lake Public Library on Tuesday, April 2, 2016. 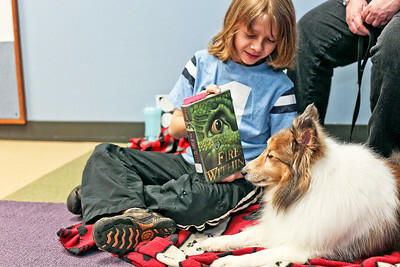 Michelle LaVigne/ For Shaw Media Eleven-year-old Charlie Davis of Crystal Lake, shows Joey, a member of the Pet Partner volunteer team, the book that he will be reading to him at the Crystal Lake Public Library on Tuesday, April 2, 2016. 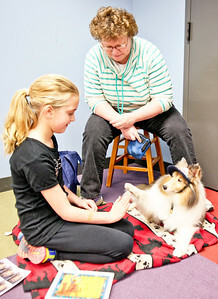 Michelle LaVigne/ For Shaw Media Joey and his owner Kathy Feuillan of Algonquin listen as 11-year-old Brooke Slonneger of Crystal Lake reads during a visit from the Pet Partner volunteer team at the Crystal Lake Public Library on Tuesday, April 2, 2016. 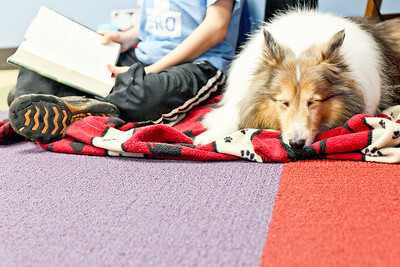 Michelle LaVigne/ For Shaw Media Joey takes a little snooze while being read to during a visit to the Crystal Lake Public Library on Tuesday, April 2, 2016. Joey is a part of Pet Partners Therapy Animal Program and has been coming to the library for the past nine years. Reading to a dog provides children the opportunity to practice reading in a relaxed, accepting environment. Michelle LaVigne/ For Shaw Media Ozzie gets a better look of six-year-old Andrew Eisch of Crystal Lake while his six-year-old friend Lyla Haase of Crystal Lake reads from a book she selected from the Crystal Lake Public Library on Tuesday, April 2, 2016. 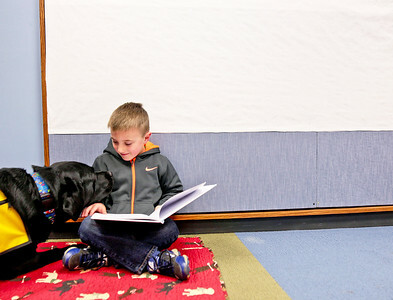 Five-year-old Eli Parks of Crystal Lake gets settled in to read to Ozzie, a member of the Pet Partner volunteer team during visit to the Crystal Lake Public Library on Tuesday, April 2, 2016.